So i was using the new retime simulation in RF 2012. retimed to .5. to make it slower. when it finished, my sim had new particles added to it. 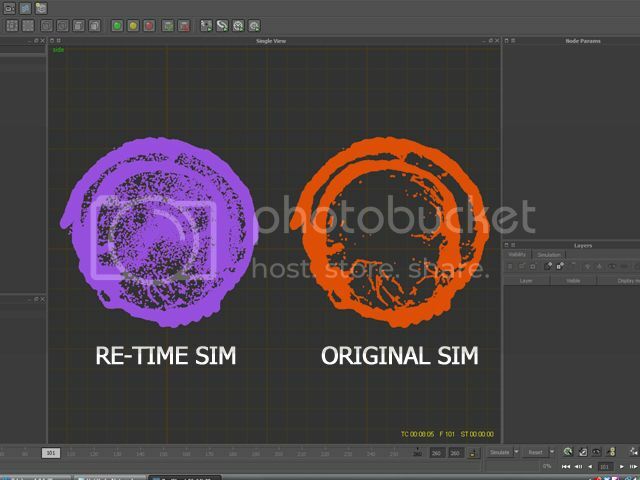 like scattered/ sprayed over particles around my original sim. the sim is slower. but why are there new particles added? and can i remove those wrong added particles? this is what im referring to. i think its the in-between frames that was created that have this look. im hoping its just somewhere in the settings. because i really need to re-time this sim. - re-time curve is at default. did not reset. fixed it. i set 'interpolation method to NONE. And it looked better. Oh, Cool.! thanks for sharing how you fixed it, had similar problem. let me try your solution. just a quick question, why did you set the time to 0.5 ? isn't that to make it faster?